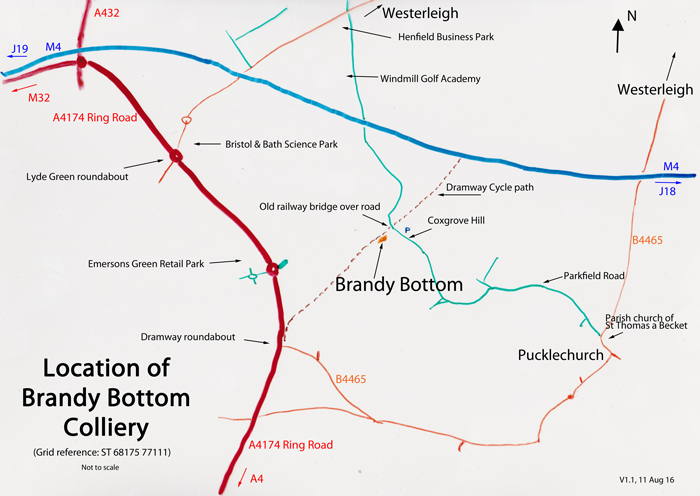 As well as an introductory page, the other Brandy Bottom pages cover the history, and the AIBT's conservation work at the site. The latter is divided into several sections: a summary of the progress at work parties, together with pages of photos of the buildings, work parties, finds and nature. There are also images of the display boards. Brandy Bottom is currently a working site, and can only be visited during work parties. Special arrangements can be made for groups of 10 or more - please make contact via the AIBT’s email address of info@aibt.org. Please note that these dates may be altered at short notice, so newcomers to work parties are advised to first make contact via the AIBT’s email address of info@aibt.org. Youngsters must be accompanied at all times by a responsible adult. The times, which are nominally between 10.30 am and 3 pm may also be changed during the course of a particular work party. Turn off the A4174 Ring Road at the Lyde Green roundabout, taking the road to Westerleigh. At the next roundabout take the second out, again following the signs for Westerleigh. About 1 mile after crossing over the M4 motorway, turn right following the signs for the 'Henfield Business Park' and the 'Windmill Golf Academy'. About 500 yards after passing under the motorway, the road turns sharply right. After another 300 yards there is another sharp turn, this time to the left with a road sign marked 'Coxgrove Road' on the outside of the bend. There is a stone bridge over the road 100 yards beyond the bend. Car parking is limited to the road verges on either side of the bridge. 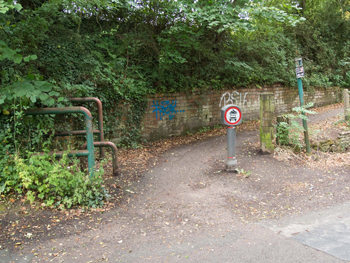 After leaving the cars, take the sloping path up to the cycleway (see photo right), and turn left at the top away from the bridge. It is about 100 yards to a ruined platelayers hut, when you continue on the tarmac path between two halves of a mine winding wheel. Brandy Bottom is located on the left of the path a further 100 yards on from the wheel. A downloadable copy of the location map and directions can be obtained by clicking on this link.